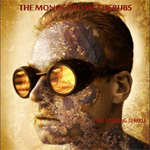 It's been nearly six years since we've heard from New York State's The Monochrome Cherubs, but I suspect they've been busy concocting their fourth release, Pure Grinding Sparkle. And it seems different from previous material. Their sound seems more stripped down and raw, perhaps to a more garage band feeling. The guitars are sharp with riffs strong and cutting like a machete, the leads even more anxious and rousing. You get this from the start especially through the first four songs, and definitely later with Someone Else's Dream and Your Last Chance. Then add Michael Sciotto's thumping drums and crashing cymbals and you have a steely, industrial (not the music genre), machine like sound. Pure Grinding Sparkle has the sound of a heavy manufacturing machine thudding out widgets with intensity and volume, and possibly soon to lose control. If it were not for the inherent melody the band composes, the songs, thanks to the guitars, could easily turn in upon themselves and make the songs abrasive. A possible exception to this could be the title track which seems to dial things back just a little bit. It also has the sweetest, but short, guitar solo on the album, a contrast to everything else. Also suspiciously absence are the prog elements from Blisterene; though they were nuanced, you could still pick them up. You really don't catch any of that here. Ultimately, it seems that TMC was going more for straight heavy/hard guitar rock, with an edgy and blistering presentation. Okay, then: I'll be looking for something different four years from now. With Pure Grinding Sparkle The Monochrome Cherubs seem to be favoring more a straight heavy/hard guitar rock, with an edgy and blistering presentation.